First off, thanks to the over 100 people who participated in yesterday's free Word print giveaway on my Facebook page. Yesterday morning I said I'd give away one print plus an extra one if I got up to 750 "likes" by 5:00pm (I was at around 705). My Facebook peeps took on the challenge and got me up to 761 "likes" so two folks ended up with free prints! If you want to take part in future giveaways, make sure you "like" my Facebook page and/or follow me on Twitter. Last week we saw Peter's peaceful and tender side. He encouraged Jesus followers to respond to evil with blessing. But just as you think Peter is walking around dishing out flowers, Sweet Tarts and hugs to everyone he meets, we get to Peter's thoughts on false teachers within the church. Let's just say they he won't be sending them a bouquet of roses. Peter, why you gots to be such a hater? 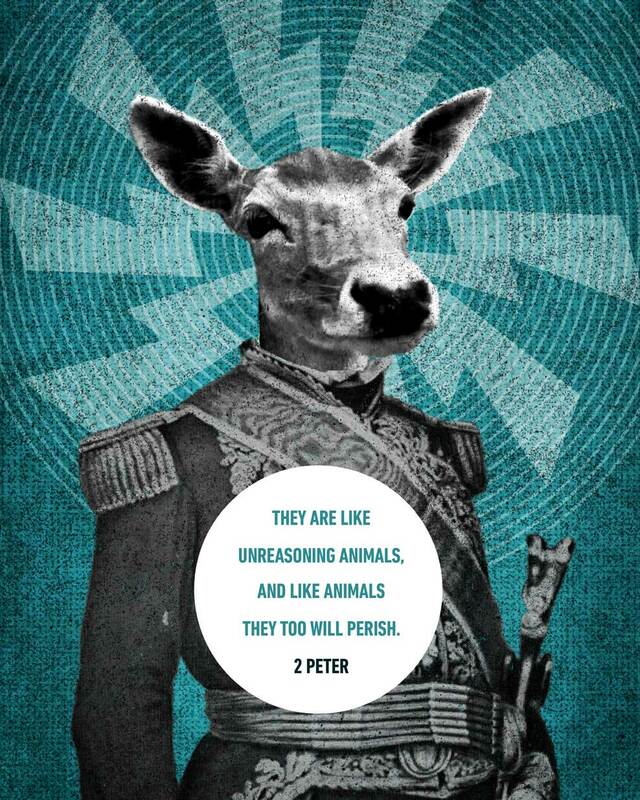 If you read 2 Peter, you'll realize quickly that Peter is pretty upset with false teachers in the church. I first noticed it when he he said they would perish just like the dumb animals they are. Not too many ways to interpret that. At first I wondered what the big deal was. I mean, so a few people are telling the rest of the church folks that the square root of 1463897 is 1209.916112794603 when it's actually 1209.916112794602. C'mon, Peter. How 'bout you count to 10 and just let that one go, huh? But here's the thing... these false teachers were not teaching math. Apparently, there were some people in the church who were teaching not out of love, but out of greed and selfishness. The text doen't get into specific details, but I'm guessing these were the folks who pulled up to church in a brand new 100 A.D. Ferrari and wore Armani suits with imported camel hair. This sections mentions homosexuality and politics! Again, Peter has softened a bit towards his enemies and instead of getting bent out of shape when he's persecuted, he's now a blessing machine. But if someone within the church starts perverting the beauty of Jesus for your own personal gain, he turns into the Incredible Hulk. As I thought about this, I feel like it says something about what kinds of things should turn us Jesus followers into the Incredible Hulk. What kinds of things should make us irate? There are a lot of things we do Hulk up about (politics, laws, homosexuality, etc. ), but should we? And who sets the criteria? Who determines that homosexuality is something we Hulk up about but gluttony is not, even though it's mentioned way more often in the Bible? What's interesting about Peter's transformation is that he used to Hulk up to everyone about everything. If his fish was overcooked, he probably went off on the person who cooked it on the fire and then yelled at the fish for allowing itself to be overcooked. But now he says to bless your enemies. What he does Hulk up about is when someone is distorting the beauty of Jesus. Actually, that's not even entirely true. He doesn't seem to hold folks outside the church accountable to that. He gets irate when it's someone within the church doing that – someone who claims to be a Jesus follower. He'll get in the face of people within his community. After all, they signed up for this Jesus thing and being corrected and called out is gonna be how you grow, right? But for everyone else who hasn't joined the Jesus camp? Seems like you do your best to show them the beauty of Jesus, but then you let it go. No need to get huffy and cover yourself with green body paint. Just let it go. But what if someone hurts Jesus' feelings and makes him cry? There are a lot of non-Christians who rail at God. (More than a few Christians too, but not my point here.) If I'm striving to be like Jesus, my response must always be loving and that means I have to give folks space to do that. I try to show the beauty of Jesus for sure, but all those times where I feel my fallen nature get all Hulked up, defensive and needing to be correct as though it's some kind of school test, I have to let it go. In fact, I think there's even a verse in the Bible that says the world will know that I'm a Jesus follower because the see me do that very thing. Jesus doesn't need me to protect him from having his feelings hurt by things people say about him. He's got some pretty thick skin, knows his true identity and has a bottomless well of love and forgiveness. So what is my job then? Bless 'em all and let God sort 'em out.